Harry Potter, Transformers 3, Larry Crowne, Don't Be Afraid of the Dark, and Monte Carlo were just a few of the movies that premiered this week as the summer movie season is in full swing. The beginning of the end of Harry Potter is here. 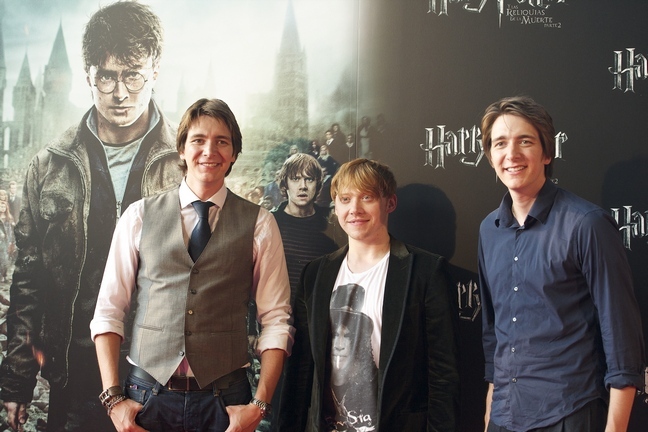 Yesterday the Weasley brothers, Rupert Grint, Oliver Phelps, and James Phelps, hit Madrid, Spain for a photocall ahead of the premiere of "Harry Potter and the Deathly Hallows Part II". I'm excited to see the movie, but as a huge Harry Potter nerd, I'm heartbroken that it's coming to an end. July 15th will be bittersweet. Rosie Huntington-Whiteley attended the U.K. premiere of "Transformers 3: Dark of the Moon". Reports suggest that movie-goers are getting tired of 3D flicks already, but this one movie that I'll definitely be seeing in 3D. Julia Roberts hit the red carpet for the premiere of her new movie "Larry Crowne". Katie Holmes attended the NYC premiere of "Don't Be Afraid of the Dark". Maybe it's just me, but I think she looks so much like Kate Middleton, Duchess of Cambridge, doesn't she? Selena Gomez attends the premiere of her new film "Monte Carlo". She co-stars alongside Leighton Meester and Katie Cassidy. Tom Hanks and Rita Wilson arrive for the premiere of "Larry Crowne" at Grauman's Chinese Theater in L.A.